In the same way there have'nt at Mercedes since 2010. Is Rosberg any good or is MS a has been. TBH Kimi should do better against Grosjean than MS against Rosberg. Grosjean was clearly a good GP2 champ but surely not at Rosberg's level at the start of 2010 in F1. I think thats how I'd take a preliminary look at it anyway. Fair point, but I was praising Rosberg for 2009. I recall him being my driver of the season, or certainly one of them, for his level of speed and consistency. He certainly upped his game for Williams in 09 over his performance from 07 & 08 which was promising but riddled with errors which ruined chances of good results. But he's still a driver who frustrates me. On paper he's a driver capable of wining races, maybe even gate crashing a championship fight or two. But he's yet to do a race in which you'd say... he really out-performed the car there and would have been a worthy winner. It's a shame because I really want him to join the Vettel, Button, Alonso, Hamilton, Webber club and be a regular winner, but I fear he's going to be another Nick Heidfeld. Maybe it'd just take his first victory and he'll up his overall level more consistently from there. Over the years he has shown cosistentcy and good performances, and rarely seems to get involved in accidents. It's been quite common for him to impress people, including Martin Brundle and several people on these forums over the years, but for some reason he always gets forgotten. I don't think he's ever really under-performed, either. I don't remember the details, but I remember in 2007 that it wasn't uncommon for him to be running 4th or 5th in the Williams, making quite a few aggressive overtaking manouvers (Australia sticks in my mind), and virtually every race Martin Brundle said how impressed he was with him. 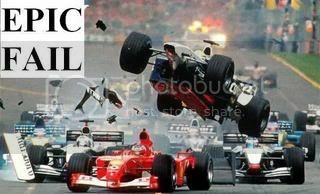 And since he's had Michael Schumacher as a teammate, he has at least matched him. You can't really ask much more from him, really. When you think about it... Spa 2011, Singapore 2008 and 2009 - three great performances off the top of my head, so it's not as if he's never had any great races. He's had good races sure, in general he's fairly impressive and can be aggressive (right from his gp2 days) but he's yet to show that "stood up in the car" performance that makes you really go wow! He's usually good and promising but rarely "man of the day". For example, Alonso this year had a car/package that was basically incapable of challenging Red Bull or Mclaren. Yet.. He routinely dragged that car into positions it didn't deserve to be in, he was particulary good at Abu Dhabi. My point is Rosberg never transcended the form of his car and put it on an unlikely podium, he had a decent showing at China but it was spoilt at the end when he went continually backwards.. When I mentioned how good I felt he'd been in 2009, I did quantify that by pointing out that he didn't really have any pressure. There were no expectations. As much as most didn't want to, most of us believed Williams were only going to continue on their downhill path. It was him not being named in the top 10 drivers of 2009 somewhere that surprised me. Rosberg showed in China this year that he really wasn't used to coping with that pressure. He probably didn't have the car to win, but he just wilted away in a way he shouldn't have. He didn't have an answer to Hamilton when the gap closed, and it was embarressing with how much ease Hamilton drove through him. If he had a car to consistently challenge up the front, it would be nice to see if he learned to deal with the pressure that comes with it, but at the moment, I don't think he can. Of the two, I think Schumacher would just rise above him and while he wouldn't dominate, I can't help but feel he'd automatically become team-leader, and this time without any help from bosses and B grade team-mates. Yeah, like you both said China 2011 wasn't a great showing. I think it's all down to his confidence, tbh. I think he might have been intimidated by what was going on, and maybe that would explain why he made a silly mistake in the Singapore pitlane when he was on course to his first win. I think the power dynamic between the Mercedes drivers is pretty finely balanced, with Schumacher threatening to take control. After his string of strong post-Montreal performances, he came close to overtaking Nico on points with a couple of races left. I sensed that if Nico hadn't bounced back in Abu Dhabi and Brazil and MS had finished ahead of him on points for the season, it would've been a massive psychological blow. It'll be interesting to see how their situation works out in 2012. I don't think he was set to win at Singapore, pit lane mistake or not. He should have been on the podium but I don't for a moment he'd be able to take the win over Hamilton that day. UK folks, season review on BBC1 on Saturday 31st at 1pm. I've said before and I'll say it again - the BBC's F1 season reviews annoy me. 1 hour isn't a long enough time to fit 19 races worth of F1 review into. Make a review 2(or even 3) hours long and show it on BBC2 if you're worried about it taking up too much airtime on BBC1. FFS. Yeah, it was just about Vettel, Button and Hamilton. Pretty dull if you ask me. It also featured minimal footage from the races themselves. For a Motorsport season review that's surely an epic fail. I thought Alguersuari would get it. Perhaps he was offered it and turned it down in the hope of filling in one of the few remaining seats? > I thought Alguersuari would get it. I'm still not sure what to make of it...he could either be being lined up to replace Webber, or could be in the test seat to become Red Bull's version of Luca Badoer and do Vettel's donkeywork. I don't know. If the seat's there to get Webber's replacement, surely Alguersuari would be a far better bet. Edited 1 time(s). Last edit at 01/05/2012 09:54PM by Incident 2k9. Maybe they know Alguesari is in at HRT but they still have an option on him to replace Webber? Gives them an internal choice of four then. I can't believe he's been dropped anyway. Even if he doesn't drive this season he'll be part of a longer-term plan, and yeah, he could well end up replacing Webber. HRT said it was very unlikely that Alguarsauri will be racing for them..... heck! that sounds like a done deal!